“What’s the deal with Pinterest?” I’ve been wondering for a while. A few blogs I follow talked about it. A few bloggers I followed started a Pinterest account. I knew that I wasn’t about to sign up for yet another thing that I feel compelled to check everyday, so I wasn’t even interested in checking it out. But one day I had some time to kill so I went on it. Pinterest is a dangerous place. Never thought of weaving shrink plastic before! Brilliant! Here’s a tutorial by A Bird in the Hand Art. 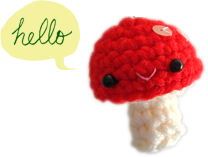 These are like Jack and Casey — except made of felt instead of crochet! :D Posted on Checkout Girl, for the book Kids’ Crafternoon Sewing. A very stylish version of glue batik! 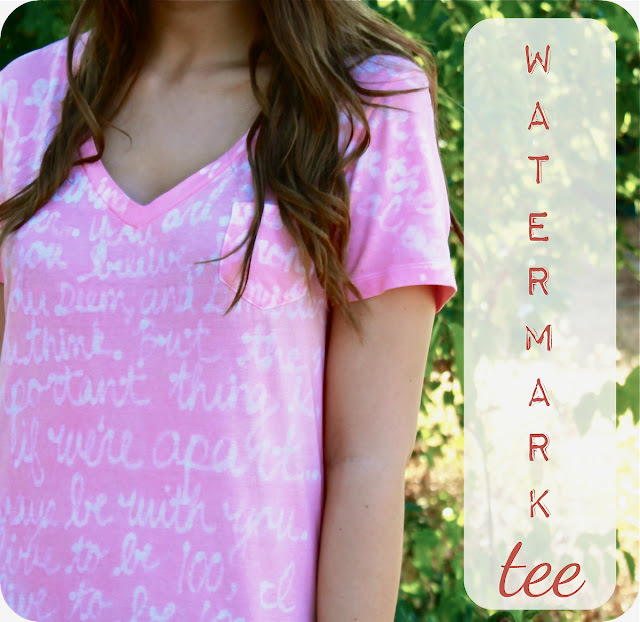 I think I’ll try it on a plain white tee I salvaged from my old closet at my parents’. Tutorial on Ucreate. 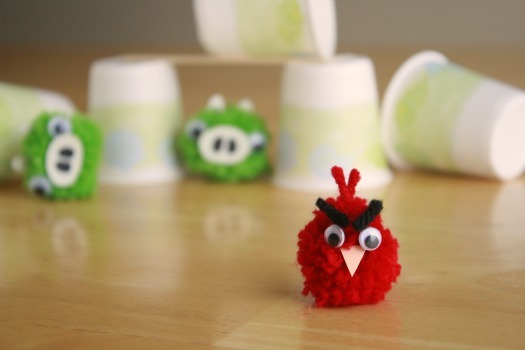 Pom pom Angry Birds and green pigs! XD Now one can set up a game of real life Angry Birds in minutes! How‐to on Make and Takes. 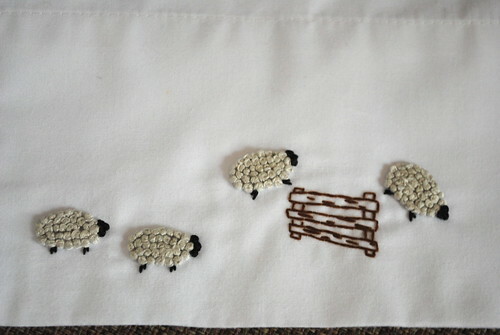 I don’t do much embroidery but these are the cutest embroidered sheep ever! And very cleverly made too. From Just Crafty Enough. Making image transfer with sand paper and wax crayons — what a novel idea! (well, to me anyway.) From Alphamom. I’ve turned men’s shirt into skirts before but only with an elastic waist, never this elegant. Maybe Mike has a shirt he doesn’t want… :P Tutorial and diagrams on Burda Style. Hanging pictures with pop tabs! Apparently it’s been tested and it works. Handy! From Apartment Therapy. A springy coin purse made with a plastic container lid and fabric! 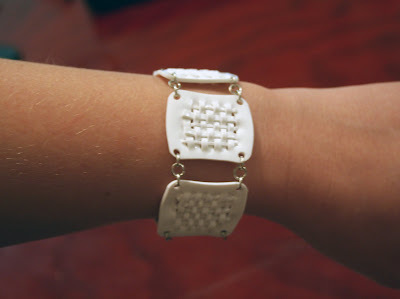 Such a clever idea and makes a great gift! How‐to on Idle Hand Empty Brain. Make your own chalkboard paint! I’m allergic to chalk dust so I can’t ever have this in my home :( or my hands will break out in eczema and be covered in a gazillion tiny blisters *shudder* (actually, same thing would happen if I pet a cat, but I do it anyway >_<)… anyway, it is a great idea nonetheless for those who can enjoy chalk, and custom coloured too! Good things come from the Martha website. Real life version of another internet meme — the Nyan Cat! :D Download template from ddi7i4d on Deviant Art! I love these illuminated photo negatives. Making them into votive holders makes a great way to appreciate them. How‐to on Photojojo. 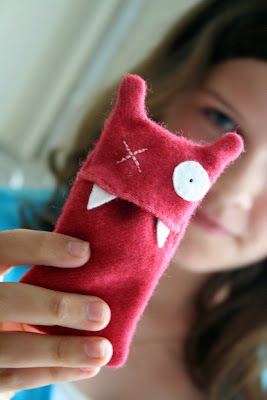 Isn’t this the cutest tiny tooth plush ever? Pattern generously shared by Knitting Pony. 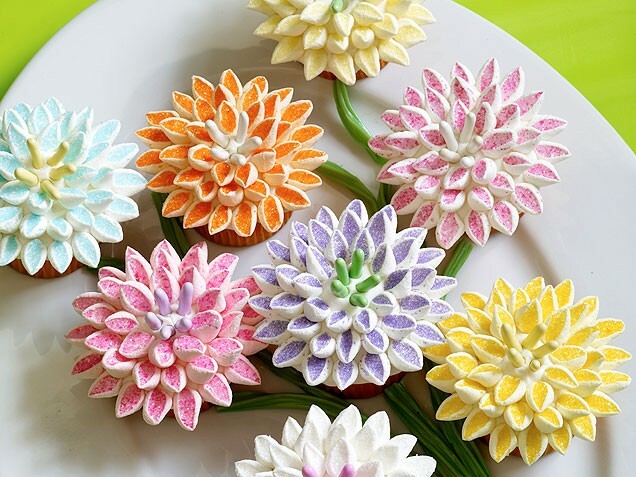 These gorgeous mums are apparently very simple to make, by cutting miniature marshmallows in half and dipping in coloured sugar! From iVillage. A while ago a friend asked me if I have an ice cream maker — I don’t, but it doesn’t seem too difficult to make ice cream with ingredients and tools easily found at home! I love projects with readily available materials. Learn how to make ice cream in a zip lock bag at 2 Little Hooligans! When I travel I always dread the luggage conveyor belt. What if my suitcase doesn’t come? What if another person has the same suitcase and mine got taken by someone else? What if I miss it as it goes by? What if I can’t get it off the conveyor belt and I get dragged along and stumble and fall on the conveyor belt? And so on. With these suitcase eyes I suppose I can at least solve the “what if another person has the same suitcase” problem. One less thing to worry about :D Via Swissmiss. - If Barbie were an actual women, she would be 5′9″ tall, have a 39″ bust, an 18″ waist, 33″ hips and a size 3 shoe. Oh, Pinterest is so dangerous, I agree. It’s nearly made me late for work every morning this week! If Mike doesn’t have an old men’s shirt he doesn’t want, try a thrift store. I have so many men’s shirt tutorials lined up (and you just supplied me with another…) so I need to find them from somewhere! 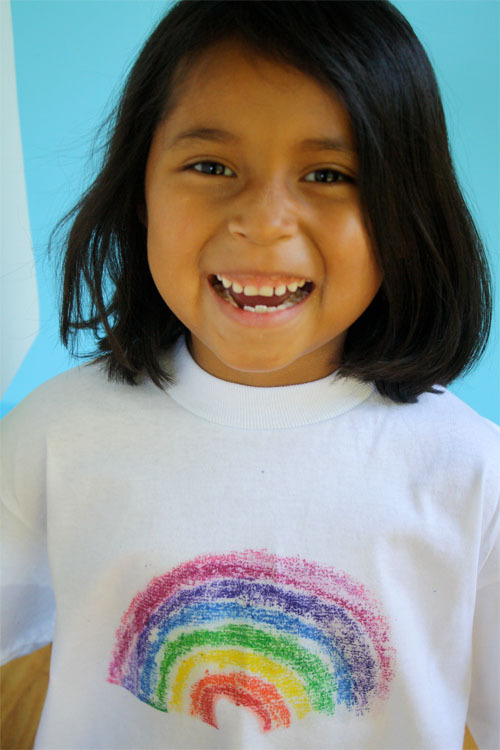 I remember making that exact tshirt with wax crayons!! what what? that’s TOTALLY AWESOME!!! ice cream made with condensed milk? no salt needed? the best thing EVER!! thanks so much, annie! i’m totally putting it in my favourite things friday next week! What would we do without your Favorite Things Friday?! You lead us to so many wonderful ideas and sites! Thank you again and again! P.S. Thank you to Annie for the additional ice cream recipe — just in time for the final hoorah of my kids’ summer! The salt in the other recipe is to help the ice melt — it doesn’t tie into the ice cream ingredients. I don’t think I’ll even go to Pinterest, you present us with enough ideas on Favorite things Friday to last a long time! Years ago when Mom was doing a lot of painting on driftwood, Dad nailed on pop tabs for hanging, thrifty man that he was. I loved the french knot sheep but have always been terrified of french knots, could never crack their mystery. Went to her video and there they were, simple as can be. Think I’ll make those sheep in celebration! drift wood + pop tab! now that’s a great idea! i came across lots of drift wood when we were at the beach, now i have a reason to bring some home :D i always learn thrifty, resourceful and often crafty ideas from my parents too! Hello! What a lovely collection of favourite things — thanks for sharing and for including my crochet tooth :) Glad you like him! love the tooth! will have to make it one day :D thanks for sharing the pattern!